The Petnica almanac is a traditional annual overview of the rich and colorful activities of the Petnica Science Center. Petnica is a unique, alternative, and futureoriented school founded by a group of unsatisfied students and located in the heart of the boiling Balkans to seek out gifted young people and help them adopt critical thinking skills, understand and accept advanced concepts in modern science and technology. Petnica Science Center is a non-government, non-profit institution which continues to exist thanks to the support and of a broad group of alumni, friends, organizations, and corporations from Serbia and abroad. Istraživačka stanica Petnica uporno nastavlja da postoji i radi. O seminarima, kursevima i kampovima opširnije na stranama 8-11. Ako vas zanima čime se bave petnički programi lingvistike, biologije ili matematike, pogledajte na stranama 48-53. Prilog o konferenciji “Korak u nauku” sa pregledom istraživačkih projekata mladih autora je na stranama 54-61, a originalne priloge na temu naučne pismenosti na stranama 66-75. 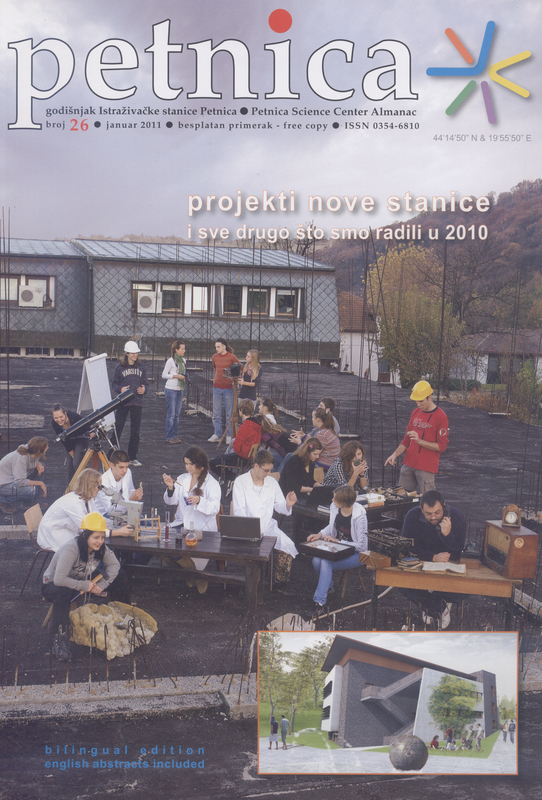 Tema broja su projekti proširenja i modernizacije Stanice i o tome dosta detalja možete naći na stranama 84-93. Još da vam skrenemo pažnju na popularne “žute strane” (14-15) i puno kratkih interesantnih priloga na više mesta u ovom broju “Petnice”. The Petnica almanac is a traditional annual overview of the rich and colorful activities of the Petnica Science Center. Petnica Center is a unique, alternative, and future-oriented school founded by a group of students seeking to participate in an build a new kind of science education. It seeks out gifted young people and helps them to adopt critical thinking skills, understand, accept and apply advanced concepts in modern science and technology. Petnica Science Center is a non-government and fully non-profit institution which continues to exist thanks to the support and of a broad group of alumni, friends, organizations, schools and companies from Serbia and abroad. Join to the Petnica Fund – many ways to support Petnica Center! Nova stanica Kako će izgledati nova proširena Stanica i šta će se u njoj raditi – više detalja o projektima. Šta o tome kaže podpredsednik Vlade i ministar nauke Božidar Đelić More details about the project of capacity expansion and refurbishing of the Petnica Science Center.